McCormick & Co. has signed a definitive agreement to acquire Reckitt Benckiser's food division for $4.2 billion. 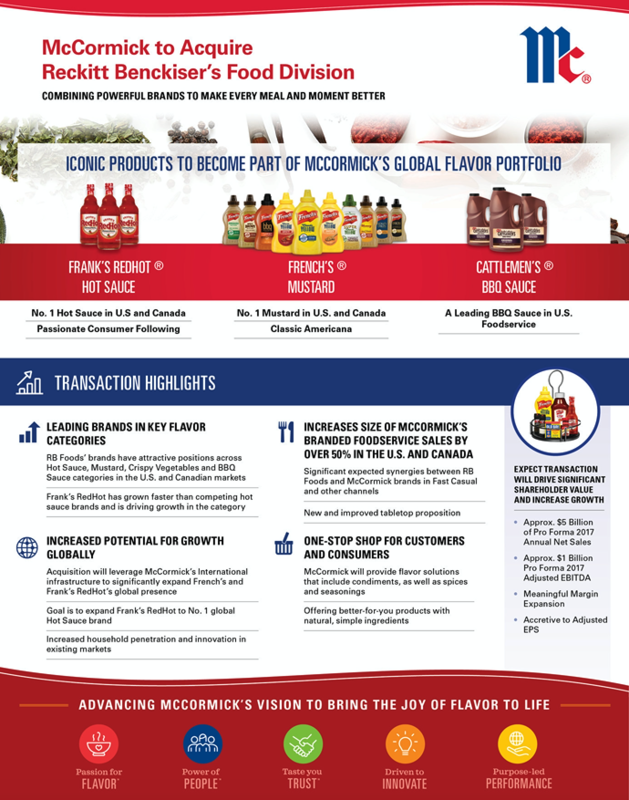 "The acquisition of RB Foods strengthens McCormick's flavor leadership with the addition of the iconic French's and Frank's RedHot brands to our portfolio, which will become our number two and number three brands, respectively," said Lawrence Kurzius, McCormick's chief executive officer. "RB Foods' focus on creating products with simple, high-quality ingredients makes it a perfect match for McCormick as we continue to capitalize on the growing consumer interest in healthy, flavorful eating." "RB Foods' track record of creating market-leading products and its dedicated state-of-the-art manufacturing facility are a strong complementary fit that we expect will strengthen McCormick's business opportunities as we expand our presence in condiments, a core category for the company in the U.S. and internationally," Kurzius continued. "McCormick will be able to grow these brands in new and unique ways through our proven track record of insight-driven innovation and the ability to leverage our global footprint." Frank's RedHot Hot Sauce, French's Mustard, French's Crispy Vegetables and Cattlemen's BBQ Sauce have all captured attractive market share positions in their respective categories, according to McCormick. Both Frank's RedHot and French's Mustard are number one in their categories in the U.S. and Canada. McCormick expects the hot sauce category to continue posting robust growth and offering significant opportunities for expansion. The company expects its growing global millennial household penetration to create substantial upside for Frank's RedHot and the other acquired brands. The deal should also help McCormick build revenue synergies through multi-brand seasonal holiday promotions and grilling events, the company said. In addition to retail, RB Foods' brands have a solid presence in the U.S. and Canadian foodservice channels. McCormick expects these products to boost its industrial segment growth by increasing sales by over 50%. As a result of increased scale, McCormick expects to achieve cost synergies of approximately $50 million, the majority of which will be achieved by 2020, with anticipated synergies split between selling, general and administrative expenses and cost of goods sold, the company said. For RB, the sale followed "a comprehensive strategic review" of the food business. “Following the acquisition of Mead Johnson Nutrition [in February 2017], this transaction marks another step towards transforming RB into a global leader in consumer health and hygiene,” RB chief executive officer Rakesh Kapoor said in a statement. RB will use net proceeds from the sale to reduce its debt, the company said. The acquisition will boost McCormick & Co.'s ranking in CGT's annual Top 100 Consumer Goods Companies list, where it placed 99th in 2016 with $4.3 billion in revenue. RB ranked 43th with $13.2 billion in 2016 revenue. The food unit accounted for $514 million of that total.